As the calendar turned over and the New Year’s organization bug hit, I dove into some cabinet organization. Boy, did I find more than I was expecting. I mean, I knew that the shelves were stacked to the point that something fell out almost every time I opened a door. But, I was overwhelmed by the amount of stuff I had stuffed up there. (Maybe that’s why we call it stuff?) 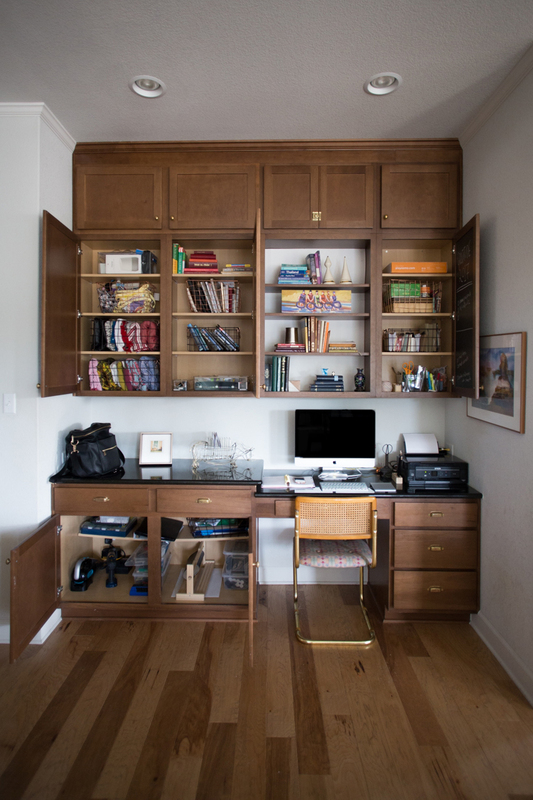 It felt so good to get it all organized and arranged, and the whole space feels more welcoming, useful, and lovely. 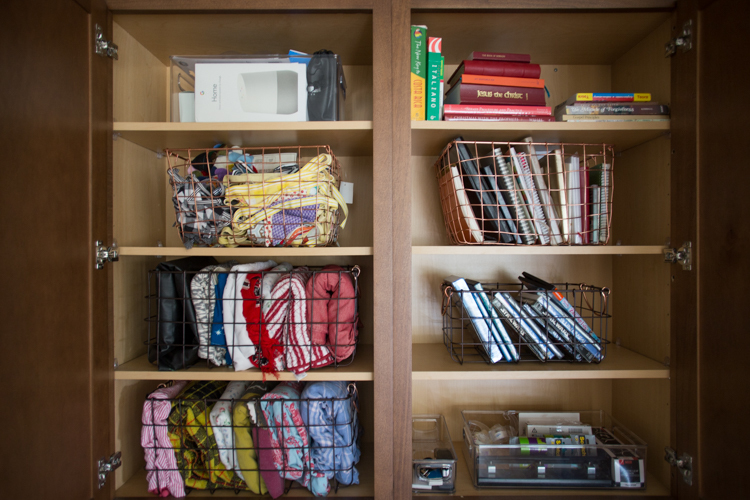 Here’s how to organize cabinets the way I did. One nice thing about closed cabinets is that they hide the mess. One hard thing about the mess being hidden is that it rarely is cleaned up. 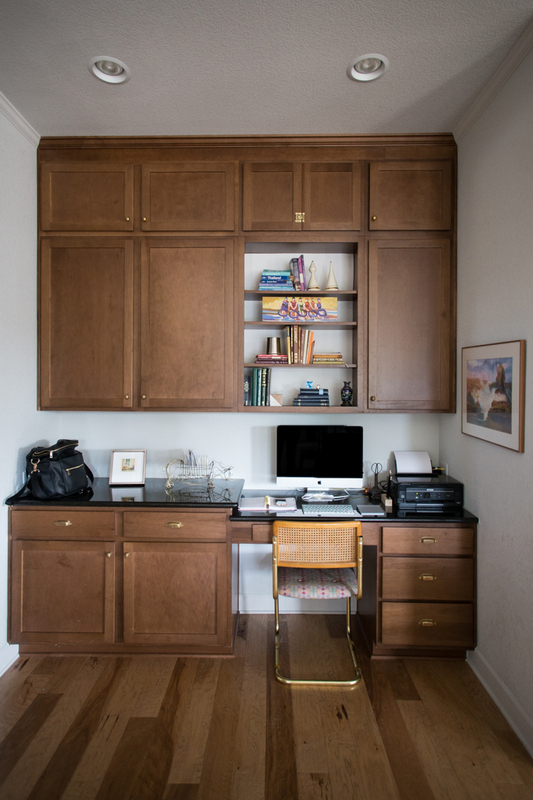 I love this built-in corner of our kitchen where I spend a lot of time working and writing, and it usually looks pretty put together at the expense of actually being organized, because I used to toss all the extra piles that end up on the counter into those cabinets for a quick clean-up before hosting. Do you want to see the before? Befores are always fun. I know. Lots of stuff!! Randomly thrown into the cabinets, because those doors hide it all. It’s reality, but it doesn’t have to be. How about a pretty after? Ahhh, I can breathe! I decided that I want to think about my closed cabinets as if they were open shelves, and organize them as such. 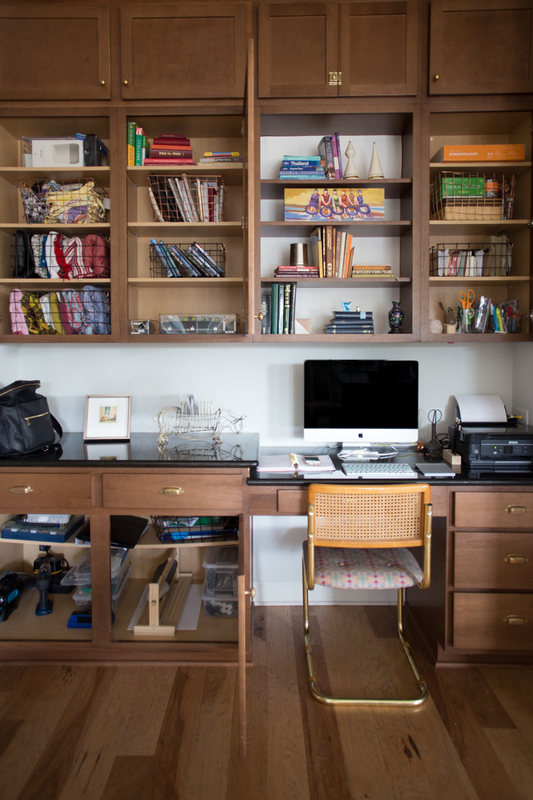 First off, that I cabinets aren’t super functional for smaller office/type items unless they are corralled into baskets, bins, or otherwise contained. 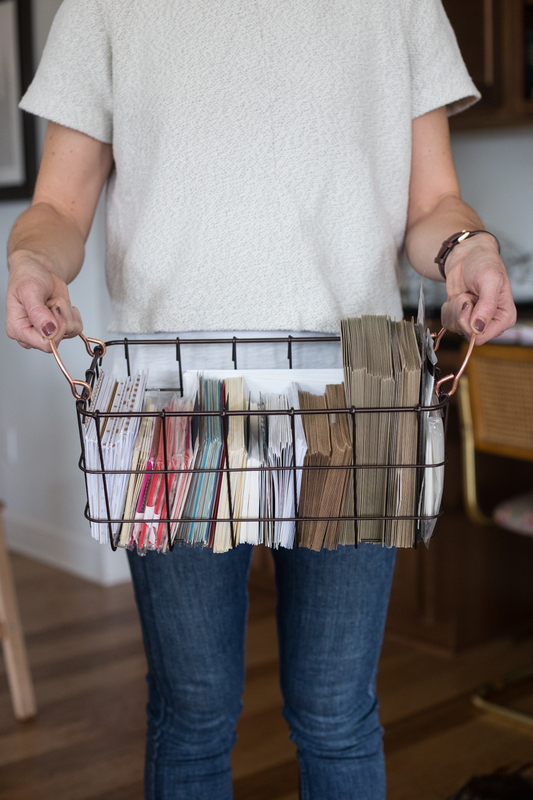 Stacking a pile of envelopes and cards on top of another stack will never look or feel organized, or use the space efficiently. 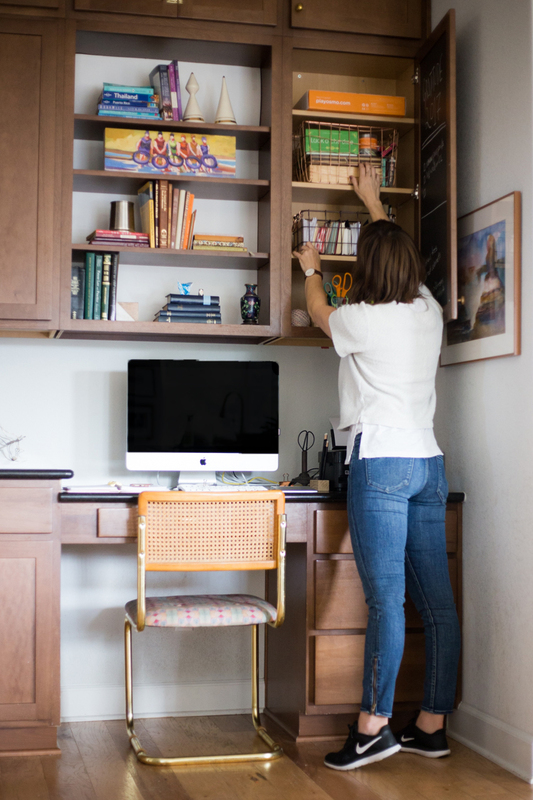 I measured my cabinets, which were surprisingly shallow at only 9″, and ran to At Home, which has become my go-to store for home and office organization. 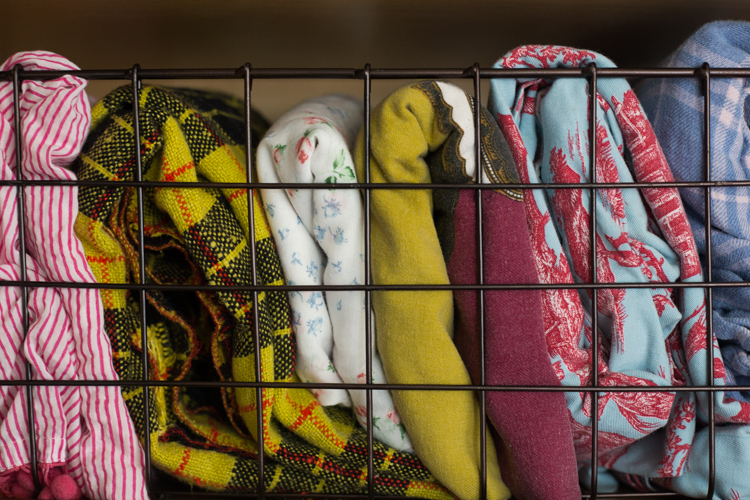 It has all of the typical plastic lidded containers, and also a huge selection of interesting wicker, wood, and metal baskets that I love. 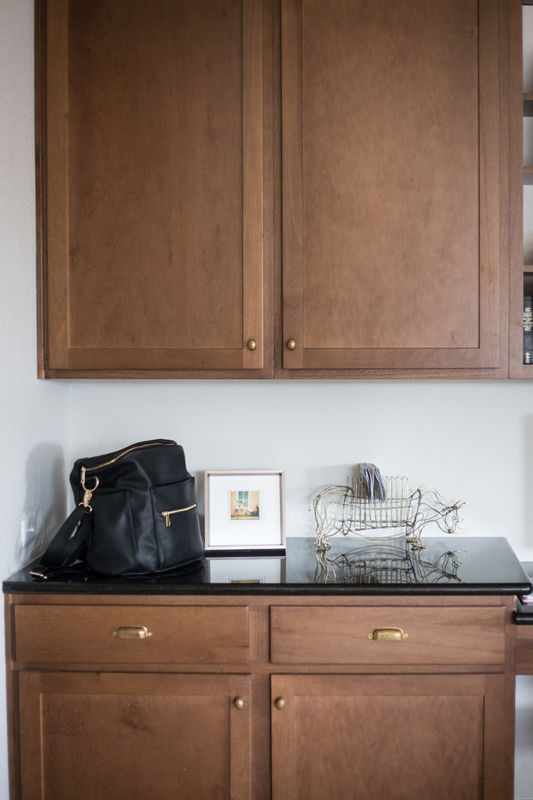 I chose some favorites a few months ago when I organized my pantry, and was excited to find a few more that would keep this kitchen office area neat and pretty. 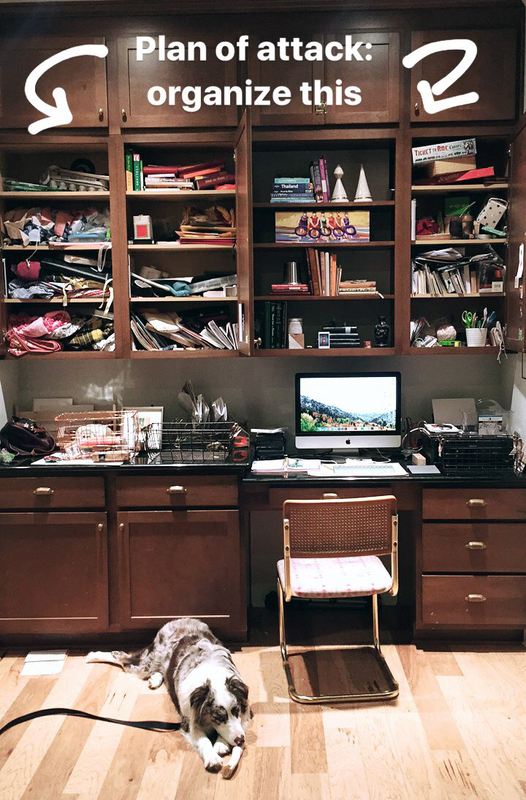 I know there is a bit of irony in buying stuff to contain the stuff, but when it’s intentional and specific, I think it feels like a great investment in creating space and a place for everything. Also, this whole project happened before our decision to stop adding stuff to our lives this year, and it was nice that through the process, we were able to get rid of excess that you don’t use. Lined up neatly with little paper dividers in this darling bronze and copper handled basket they feel more like useful, thoughtful items than like stuff. I like being able to see everything in the bin and take the entire thing down to choose the perfect greeting to send, rather than running to the store to get something new because it feels easier than digging through the messy shelf. Same went for books, tablecloths, our extensive DVD collection with 22 titles including the complete Harry Potter series, the complete Star Wars series, and our wedding video.) That was the process: take it all out, sort by type, decided what we use and want to keep, toss the rest, put what remains into pretty baskets like those cool copper wire, or neat clear bins. I have a fun collection of reusable party supplies, like fabric and felt pendants, paper fans and big honeycombs, all that were just smashed together on a shelf. It will be a hundred times easier to pull them out to use for our celebrations when it means grabbing one basket and having everything I need! I enjoyed a couple office-specific solutions as well. 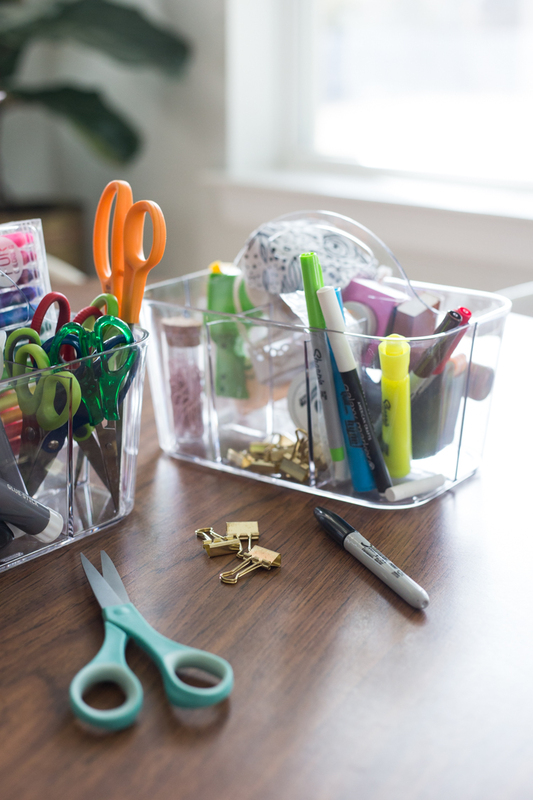 These clear cutlery organizers turned out to work perfectly for desk supplies like scissors, pens, and stamps. 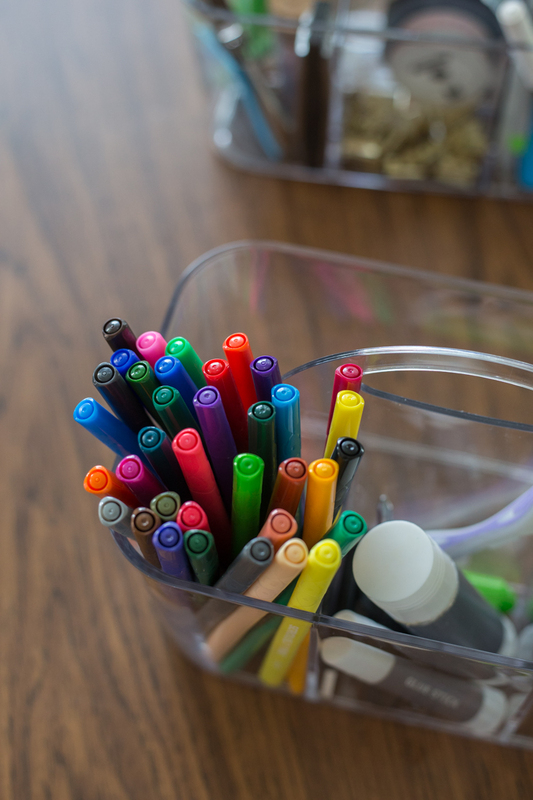 I used to have everything set out on the lower cabinet shelf, some pens and scissors in a cup. 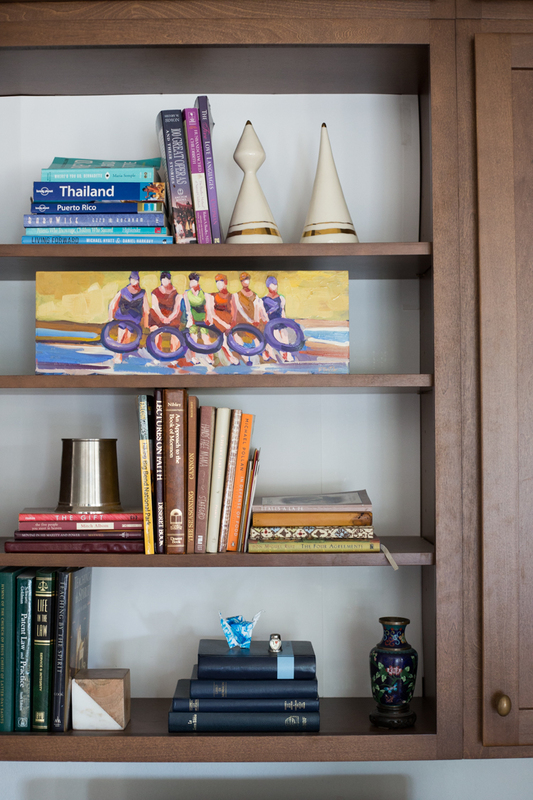 This allows everything to have a place, be seen, and be easily accessible. On the way out of At Home I also grabbed the darling metal binder clips in small and large, and a set of fine tip markers, which are my pens of choice for writing all of those birthday and thank you cards. They have a really cute collection of fun supplies near the check-out, and I am super satisfied with these little additions. They should tide me over to 2018 when we start buying stuff again. 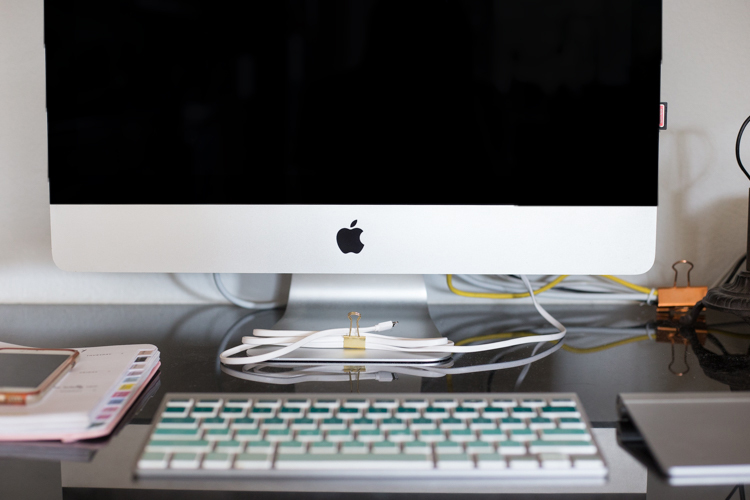 The mini binder clips are perfect for phone cords, and the larger keeps the whole behind-the-computer area put together. Super cute little helpers. 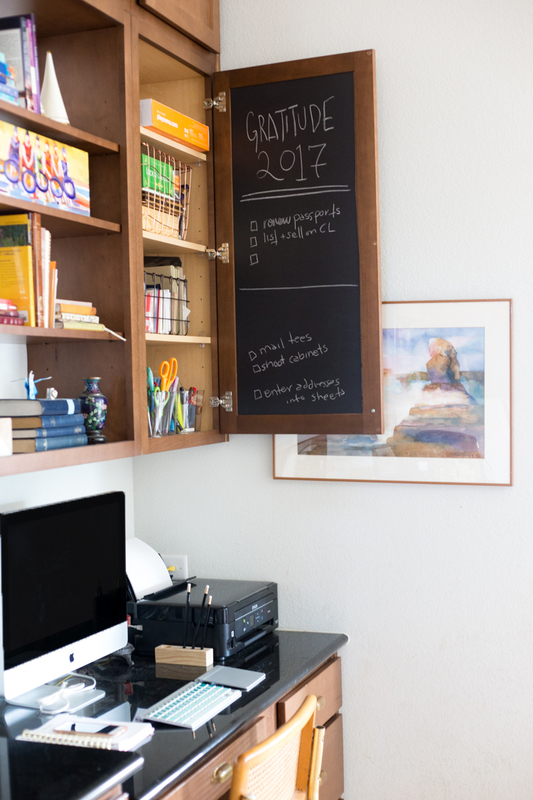 Adding a sticky removable chalkboard sheet to the inside of this cabinet was the final touch for the organization. I could cut it to fit perfectly in the cabinet frame, and it will be the perfect place to jot down to-do’s that I need to remember, or leave quick notes for the babysitter on date nights. Now that the cabinet organization is finished, I want to make sure to be able to keep it clean and nice. Maintenance is probably 90% of the battle in home organization. 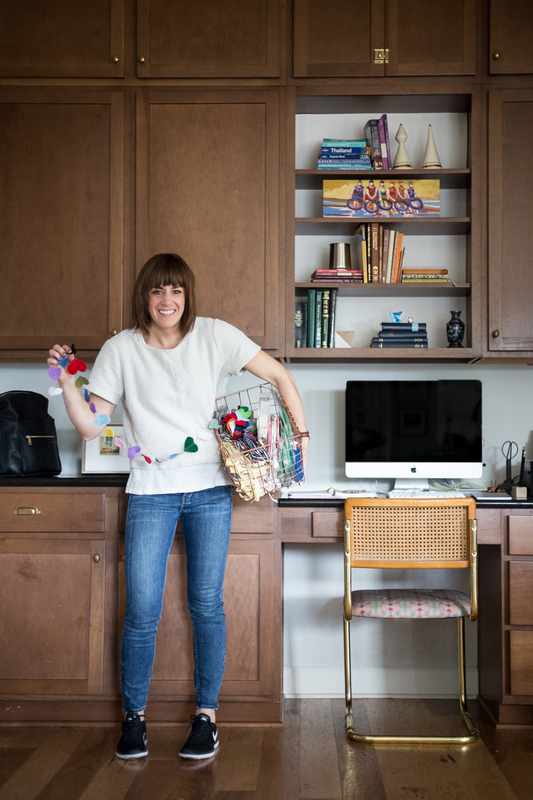 I love that the baskets fit my different items pretty perfectly, so that maximized space will help encourage me to only keep what I need and use, and thoughtfully eliminate the rest. I love an empty counter where I can store my diaper bag (that so conveniently matches my counter and hardware) and the current mail that needs attention, then leave the rest open. Then when I need something in the cabinets, everything is easily seen, grabbed, used, and put away. It feels so good to create a functional as well as pretty space! Now on to the rest of the cabinets and closets in the whole house, then not adding any more stuff for awhile. Cheers to spring cleaning!